Cash Advance Loan for The Money You Need Right Today. Short on cash? Why wait until your payday when you need cash advance now? You can get a cash loan online up to $1000 deposited in your account the same day without even leaving your comfort zone. Choose EZPaydayCash, the cash advance online loan lender, when you are in a pinch because we understand that when your budget comes up short, easy access to fast online money is what you need. Moreover, we process your paycheck loan application and deliver funds directly into your account with no credit checks, no third party, and no paperwork involved. 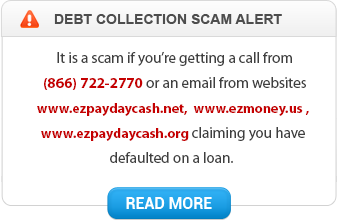 Getting advance loans from EZPaydayCash is this easy and simple. A cash advance loan is a short-term cash loan that can quickly help you deal with money crisis until your next payday. When your advance cash is due that is normally on your next payday, you pay back the borrowed cash loan amount along with the interest. Besides, the amount you borrow for emergency cash loan is relatively smaller that often means an affordable loan against your paycheck. Thus, in contrast to installment loans with fixed monthly payments over a long term, you can repay cash advance in lump sum (single payment). You can use the approved cash advance to cover sudden expenses or bills. This form of a payday loan assists you in bridging the gap between your pay checks seamlessly and hence is referred the surest way to easy and fast financial stability. When you search for "cash advance near me" over the internet for your quick cash needs, you may bump into many cash advance companies both online and storefront claiming to provide you with the best cash loans at affordable rates. Lower rates may be tempting but you have to consider the time it takes to get the loan money in your hands. You may also find cash advance places or payday loan stores just two blocks away from your home but think whether you can afford standing in lines, do the documentation manually and wait for approval. If speed, simplicity, and convenience of borrowing are what you are looking for, then, online cash advance is the suitable alternative. EZPaydayCash, the direct cash lender, offers cash advance loans online with no credit check and no faxing even to poor credit borrowers. When you apply for instant cash advance over our secure online platform, you can be assured of simple application process, quick loan decision, guaranteed approval for bad credit, and same day cash advance in your account. In addition, no collateral is required to obtain unsecured personal cash advance from online direct lenders only like us. There are no hassles of documentation because we provide only faxless advance cash loan. Thus, EZPaydayCash is the best lending source when you need a loan fast. Getting Online Cash Loan from EZPaydayCash is Trouble-Free. We are a trusted cash advance online loan lender and to qualify for a direct money advance with us, you must be at least 18 years old US citizen with a regular monthly income and an active bank account. To apply for a short-term cash advance loan, you need not leave the privacy of your home. Just access our free online application during any convenient time from anywhere, fill out your basic details, and submit. Once your payday advance is approved, the amount is directly funded to your authorized bank account. However, as a socially responsible cash lender, EZPaydayCash advises you to use your advance cash loan wisely. Remember that these online loans are short-term loans and hence are not intended for long-term usage. 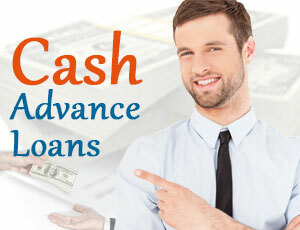 When you are out of borrowing options from traditional sources, advance cash online comes to your rescue. If you need a loan now, express cash advance with guaranteed approval for bad credit is your immediate solution. Apply for cash advance loans and get quick funds upto $1000 same day in your account.